As electronic producers we all tend to get overly obsessed with perfecting the individual parts and sounds of our tracks. We read numerous articles on compression, eq, how to create the perfect kick, whats the latest synth etc etc, and whilst all of these subjects are admirable in their own right, what none of them do is tell us how to transform our killer 8 bar loop into a finished composition. In fact we spend so little time studying arrangement that often times our loops either dont make it past their 8th bar birthday, or they end up loosing their magic entirely when stretched across a whole track. Summing this predicament up perfectly is a quote we recently read in SOS Magazine; “Great songs are 1% inspiration and 99% perspiration”, and therefore with this in mind we hope the following article sets you on the path to arrangement glory. Now before we get started its important to be aware that there are a number of established conventions which have been informing song structure for hundreds of years, and whilst rules are always there to be broken, these basic principles are still universally applied for good reason. Furthermore, like learning basic music theory, understanding these basic building blocks will actually help you break the rules more effectively and also provide alternative avenues of creative exploration should repetitive loop syndrome strike. To keep things simple we will briefly consider two typical approaches within electronic music. Both of which can be explored in much greater depth if required (see additional reading below). Songs – Are often broken down into three parts that can be abbreviated with the letters ABC. A = Verse // B = Chorus // C = Instrumental or Bridge. There are many variations of the ABC format to consider but a basic pop song would be something like [Intro ABABCB Outro]. Obviously within this structure there may also be a clearly defined intro or outro. However with a pop record or a record in which you are trying to pitch its merits to a third party the intro needs to be short and you need to get to the chorus sharpish, attention spans can be short. Take the huge pop sensation ‘Call Me Maybe‘, you may dislike the track itself but you’ll notice the intro is 5 seconds long and the chorus hits us within 30 seconds. House – Often House records, particularly vocal led tracks will retain the typical verse, chorus structure referenced above, however its important to remember that house music was birthed from DJ’s in the 80’s creating extended more mixable edits of their favourite disco & funk records, and therefore the intro’s and outro’s play a far more significant role. Furthermore as House evolved drops and breakdowns grew to be equally as significant within the final arrangement. A typical structure would be broadly speaking something like this: [Intro 16 Bars]-[Build 16 Bars]-[Main Body/Chorus 32 Bars]-[Break Down 16 Bars]-[Build 16 Bars]-[Main Body/Chorus 32 Bars]-[Outro 16 Bars]. To help illustrate the above points watch Point Blank’s deconstruction of Disclosure‘s ‘White Noise’ below and if you desire to dig even deeper, head to the additional reading links provided at the end of this article. Decide Musical goal – Stylistically what are you trying to achieve, sketch or write down how you perceive the track evolving. This doesn’t need to be super detailed, 8 bars of this or 8 bars of that, but rather just a rough outline of what you are wanting to achieve dynamically. Reference Track – Select a commercially released record that closely matches the arrangement you have in mind. Import this track into your DAW, place it at the top of your arrangement window and then break it down into its various parts, intro, verse, chorus, drop etc. Depending on the DAW you’re using you can either split the track directly, colour coding and naming each part or if like Ableton you can add locators then place these at each relevant section of the track, again naming them accordingly. To illustrate this point, view Disclosure video above or hit the above links, coloured pink. 4 to 8 Bar Loops – Gather together all the main elements of your track, drums, bass, pads, keys, vocals etc and consolidate each one into its own defined loop. 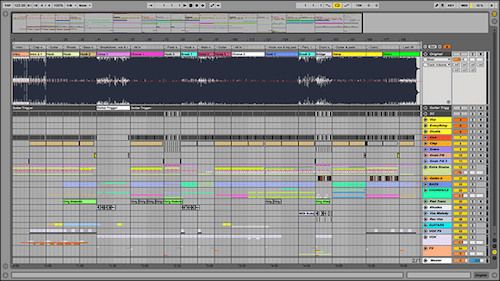 As dance music tends to be built around blocks of 4 bars we suggest either 4 or 8 bar loops for each track. Populate all tracks – This basically means take your eight bar loops and duplicate them across the whole track as defined by the reference track template we discussed above. To illustrate watch Danny J Lewis’s video below. Subtract Parts – Once you have populated your whole track the idea is you then start subtracting parts from your sequence. Again watch Danny J Lewis’s video below for an in-depth illustration of this point. Transitions – In theory at this stage you have pretty much got your basic structure locked, however you may need to smooth the transitions from one part to the next. There are many ways of achieving this such as crash cymbals, fills, risers etc etc. If this is not an area you are particularly strong in, check our further reading below.